Our high-quality Swiss-made folding cards are perfect for sending season’s greetings with a bit of Swiss culture to loved ones around the globe. 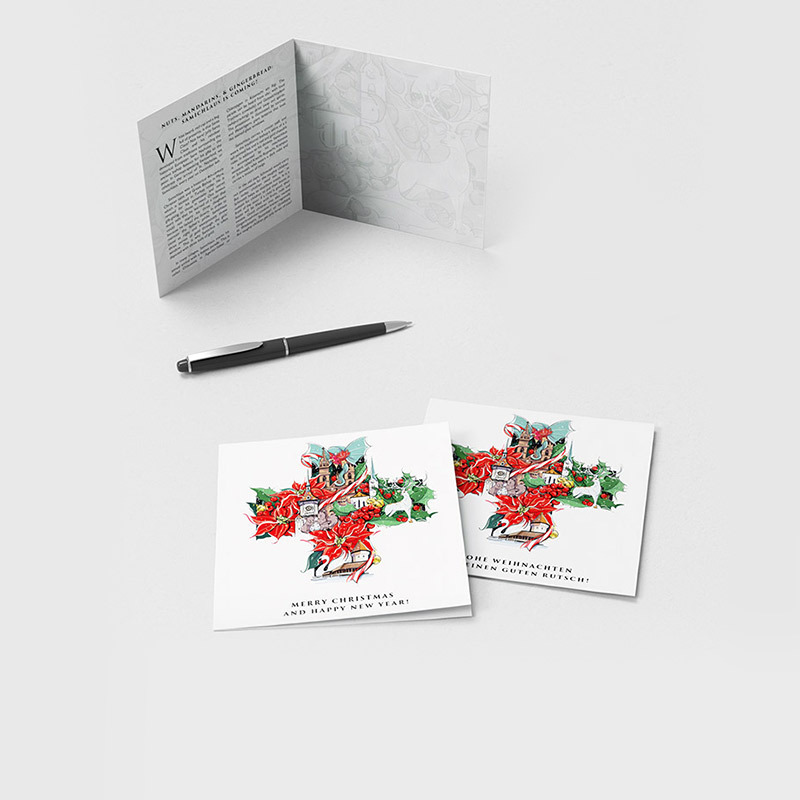 VARSY’S Legendary Christmas Cards tell the story of Switzerland’s Santa Claus, named Samichlaus, and the wonderful Swiss Christmas traditions that are celebrated around him and his helpers. The card is graced with a beautiful holiday-themed collage of various Swiss legends on the cover. Packaged in a crystal plastic sleeve, with a bright red mailing envelope. Printed in Switzerland on premium materials with the full legend text in one language on the inside. We use FSC and PEFC certified paper to ensure that our papers come from sustainable and responsibly-managed sources. Our Legendary Christmas Cards are proudly made in Switzerland, using premium paper from sustainable and responsibly-managed sources. Share the Swiss Christmas traditions with the full legend of your choice in English or German on the inside. Each card is 146 x 146 mm closed, and 146 x 292 mm when opened, with plenty of space for the legend text as well as space for a writing your own words of holiday cheer. Packaged in a crystal plastic sleeve, with a bright red mailing envelope. Our materials are responsibly sourced to make sure that the paper we use is sustainable. We want to make sure that our planet is healthy for the future generations to enjoy. A healthy environment is crucial for our children and future generations. We use environmentally friendly and recyclable products wherever possible. Our papers are FSC® Certified to ensures that products come from responsibly managed forests that provide environmental, social and economic benefits.